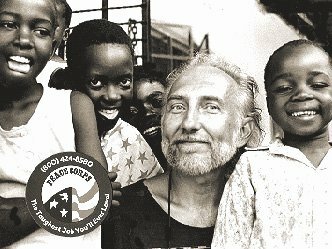 They say that an opportunity for an overseas experience is something that should not be passed by, and I acted accordingly when I joined the United States Peace Corps as an Art Conservator/Curator for the National Gallery of Zimbabwe, 1993-1995. These three years in Africa were the most fulfilling ... so far ... in my career, because I was able to project, totally and completely within the arts community ... no constraints. And that, I did. The youngsters to the left were just a few I touched, and were touched by. And their smiles, desires, wishes and deeds are still with me today. And so, we both grow in mind and spirit. I was pleasantly surprised to see that the National Gallery's Permanent Collection not only contained Traditional African artifacts, but also an eclectic mix of Contemporary Zimbabwean Art (particularly, stone sculpture) and European/English Old Masters (since the Gallery was established back in 1957 as a part of the British influence). My responsibility at the gallery was to categorize this collection, and establish a computer database for management and retrieval. I did this through a generous grant from the Social Science Research Council (NYC), and working relationship with the Conservation Officer, Christopher Chipfuya. This working relationship turned into one of close friendship, and we still keep in touch. 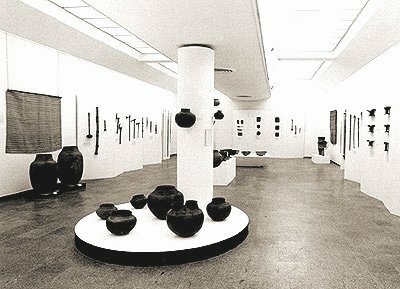 The exhibition to the right was mounted to display the Traditional African Artifacts from Zimbabwe and throughout the African continent. This view shows the Zimbabwean pieces with indigenous pots, foreground, and various tools and weapons to the left and right. Extreme right shows headrests that are somewhat unique to Zimbabwe, and iconic as they relate to this country's pride and projection. Each and every item was researched, and mounted strategically to reflect accurate nomenclature and usage. A walk through this display area conjures-up yesteryear, and nurtures the importance of Zimbabwe's heritage.